My American friends all ask me what it was like to live in England for so many years. It is really difficult to explain exactly how different the culture is there, and how stunningly beautiful it can be. 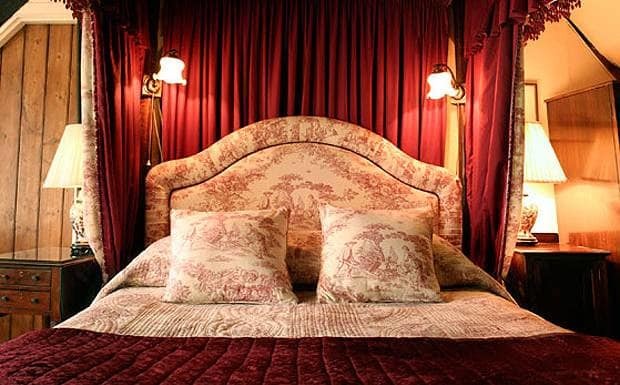 For me, Jeake’s House Hotel and the little Sussex town of Rye answers all of those questions. 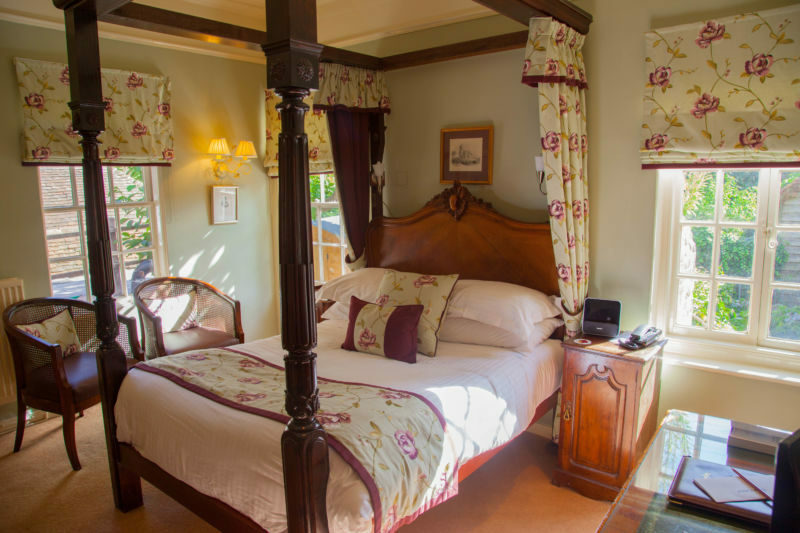 It is the perfect traditional British getaway. 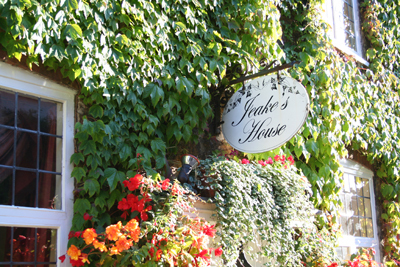 Jeake’s House Hotel is actually a set of three houses that have been linked together over the years to create this beautiful place. It was built in 1689! The floors aren’t level, the staircases are very steep and crooked, yet it is majestic, beautiful, and completely luxurious. It is located on the famous cobbled Mermaid Street. Honestly, I do not know how the heck horses and people walked up and down this street in the old days without breaking their necks. Shoes were a lot less sturdy back then and the cobbles are rough so you feel as though you are walking on an uneven creek bed. Thankfully, the hotel has a place for you to park and unload your suitcases and its own parking lot in the town a short distance away. (The town was built way before there were cars so parking isn’t easy elsewhere). 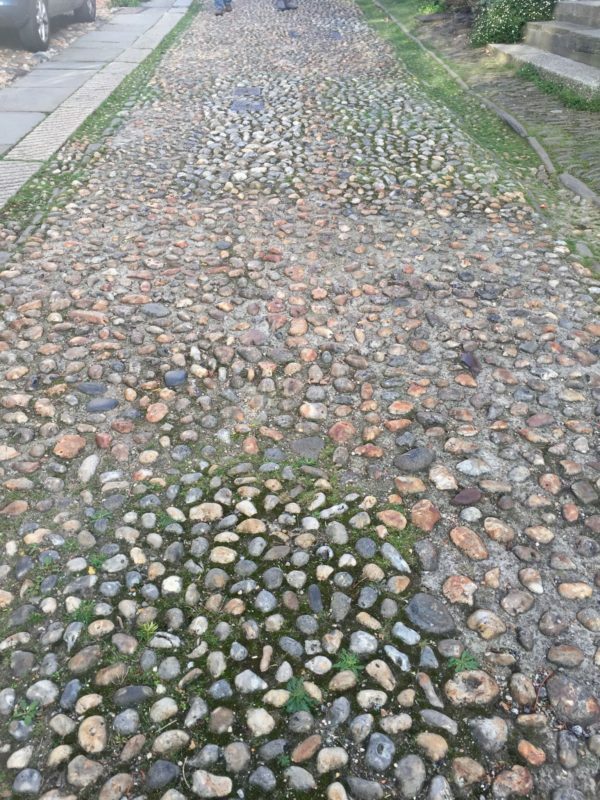 The Brit comments: The pavements (sidewalks) are narrow, so you often have no choice but to walk on the cobbled road. Adding to the character, Mermaid Street is fairly steep. 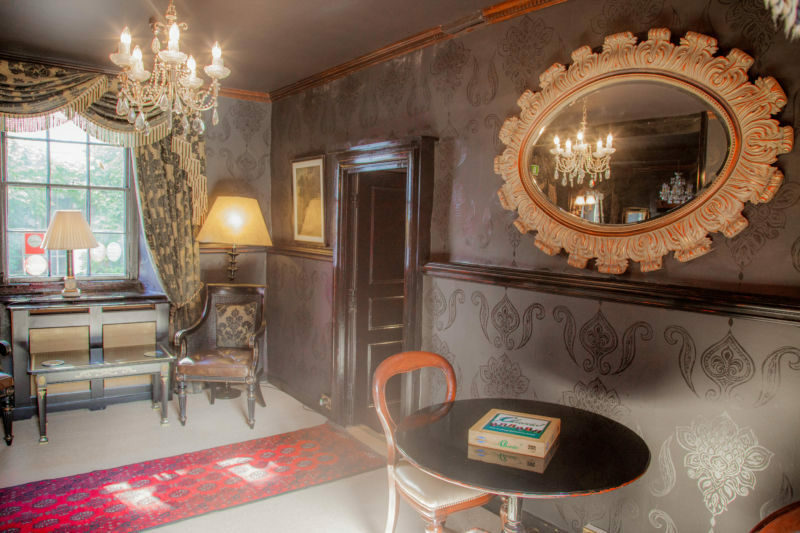 Despite the age of the building, the owners of this beautiful place have tried to install as many modern amenities as possible whilst retaining its charm and character. Mattresses are modern and so comfy you will never want to leave. All of the linens and towels are fluffy & soft; they feel amazing against the skin. The showers are “powered” so you have good water pressure and not the trickle you would expect to find in a place of this age. 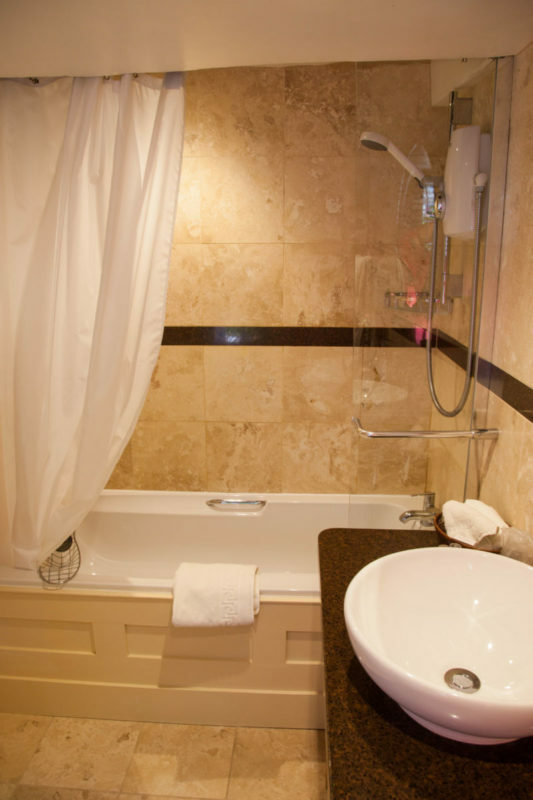 One of the bedrooms even has a traditional roll top bathtub. They provide a very generous assortment of shampoos, lotions, and comfort items to make your stay perfect. The Brit comments: The bedrooms are named, rather than have a simple number. The names come from famous Rye inhabitants, fictional and real. 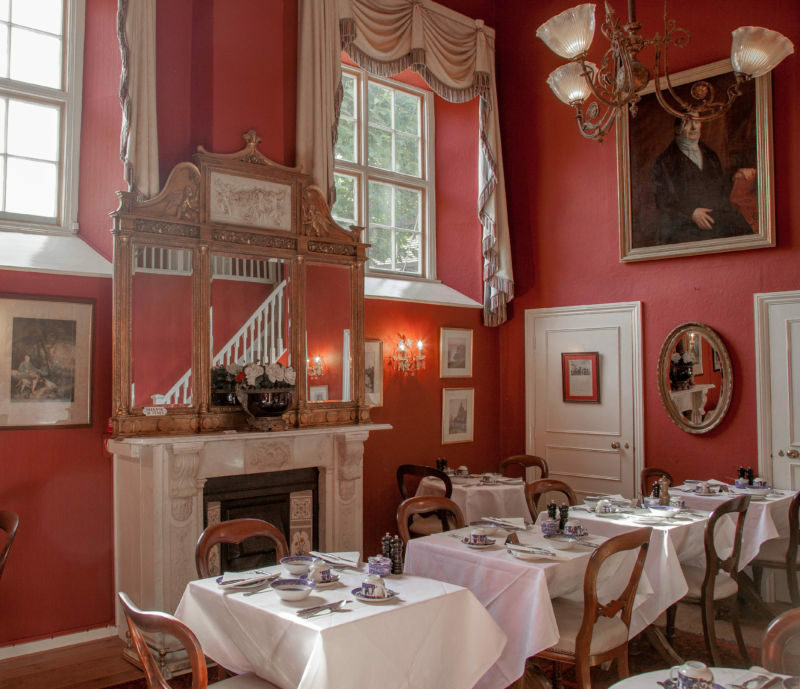 The decoration of these rooms reflect the personalities for which they are named. 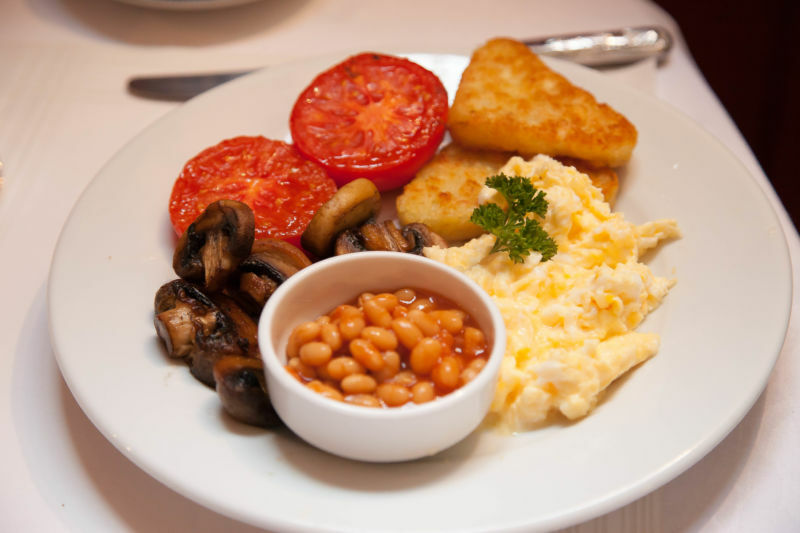 Breakfast is one of the best British breakfasts I have ever had. 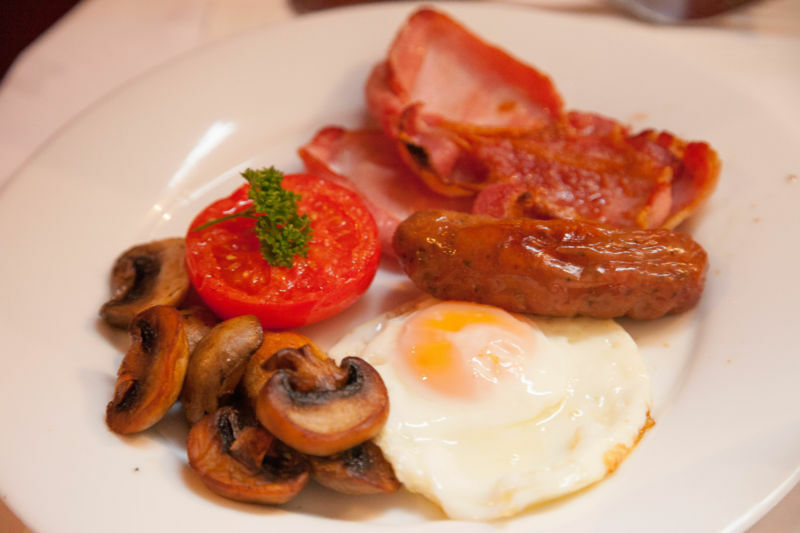 The sausage and bacon are such good quality that it is truly hard to beat. I am told that they get it from a special traditional butcher in the town. It is so delicious! Eggs are cooked to perfection every time. This morning I had poached eggs and they were the same class you would find at the finest restaurants. I definitely feel spoiled and well satisfied. 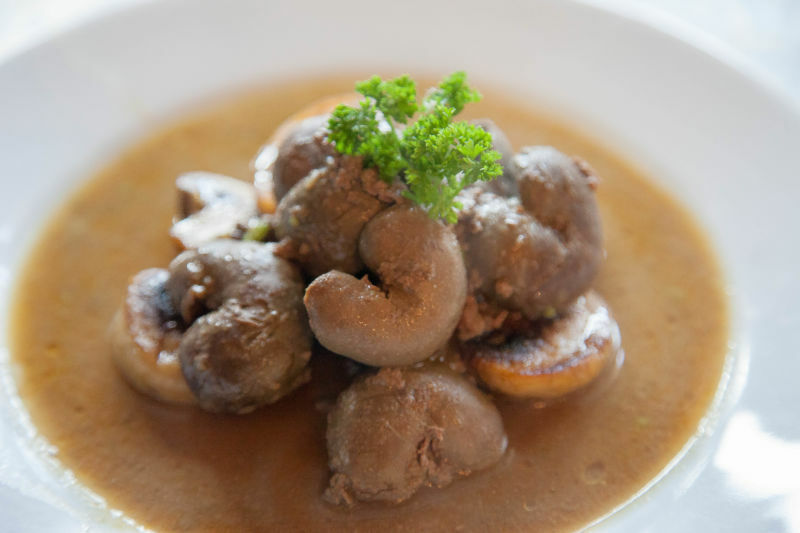 Traditional lambs kidneys and mushrooms for breakfast. 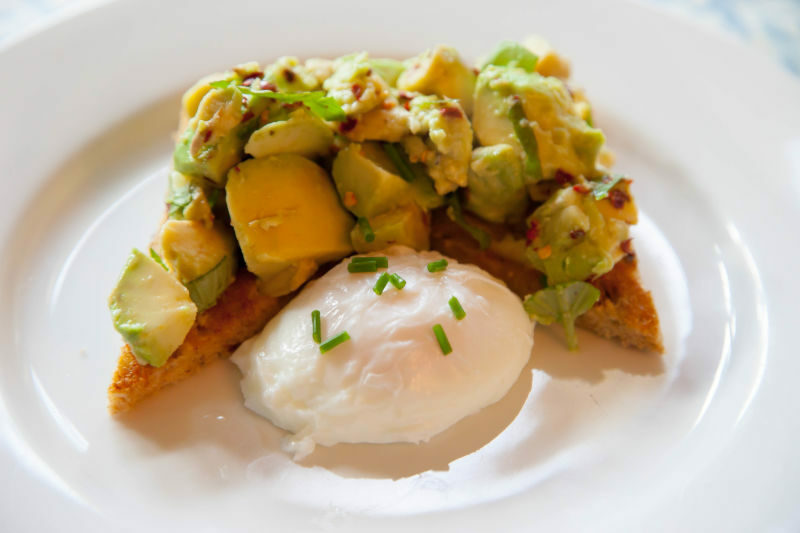 Our Paleo eating friends would love this dish. They also served smoke haddock and porridge by request. Low Carb, gluten free, vegetarian, fresh fruits, stewed fruits, cereals, homemade musili and jams; this place has it all! 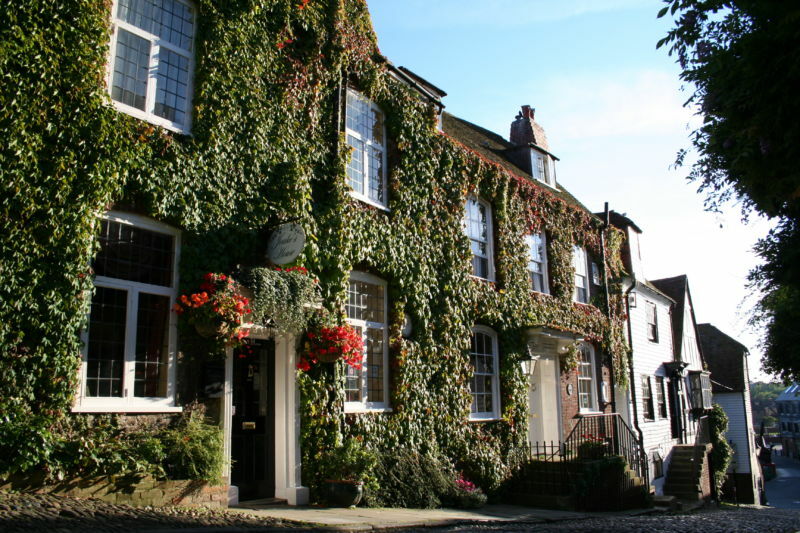 Unfortunately, Jeake’s House doesn’t serve lunch or dinner, but there are many fine restaurants, gorgeous little pubs, sandwich, and tea shops in Rye so there is lots of choice for food. We will be highlighting a few of them during our visit. Check out our post about the amazing meal we had at The Tuscan Kitchen in Rye. 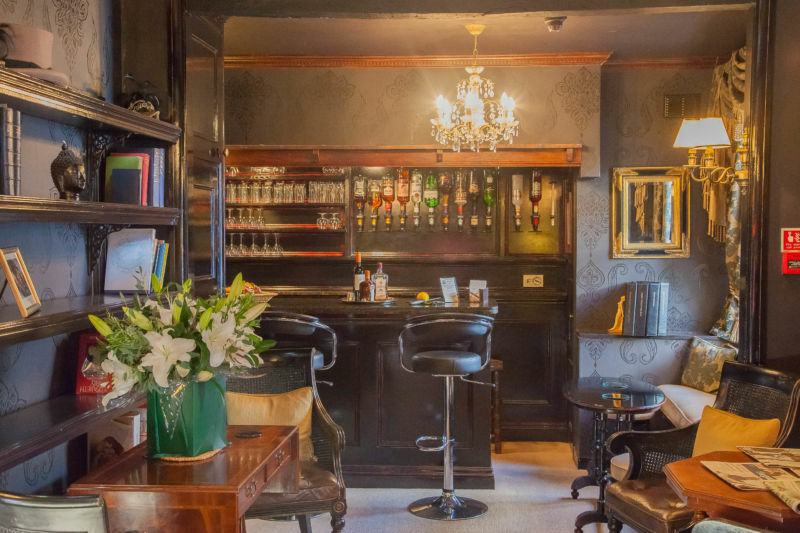 After you explore the town and the surrounding area, you can come back to the hotel and treat yourself to an after dinner drink in the honesty bar. We found it well stocked and The Brit had a good time making himself cocktails. I won’t call him pretentious (well yes, I will) but I found him sitting in the bar, drink in hand with a great big book from the bar library looking right at home. I can assure you my eyes were rolling. 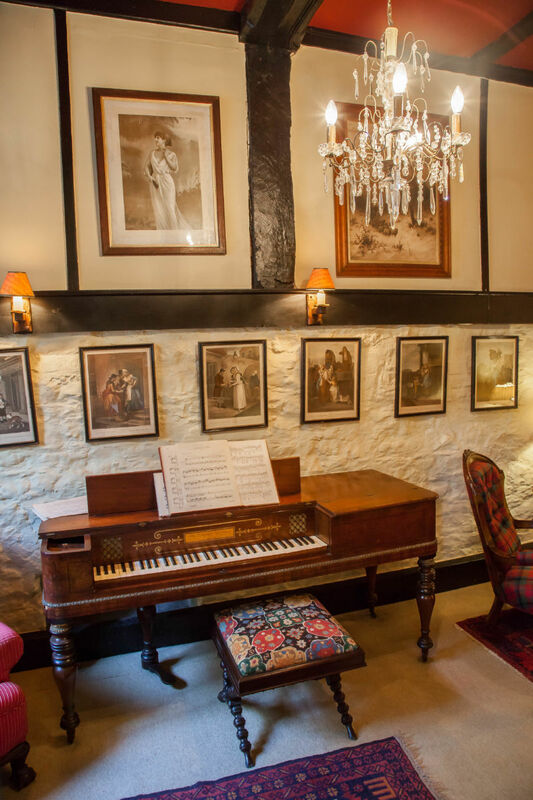 We would highly recommend you visit Jeake’s House Hotel which is the epitome of everything that is wonderful about British culture and hospitality. The price is about the same as we would pay for a Motel 6 in the Bay Area these days! 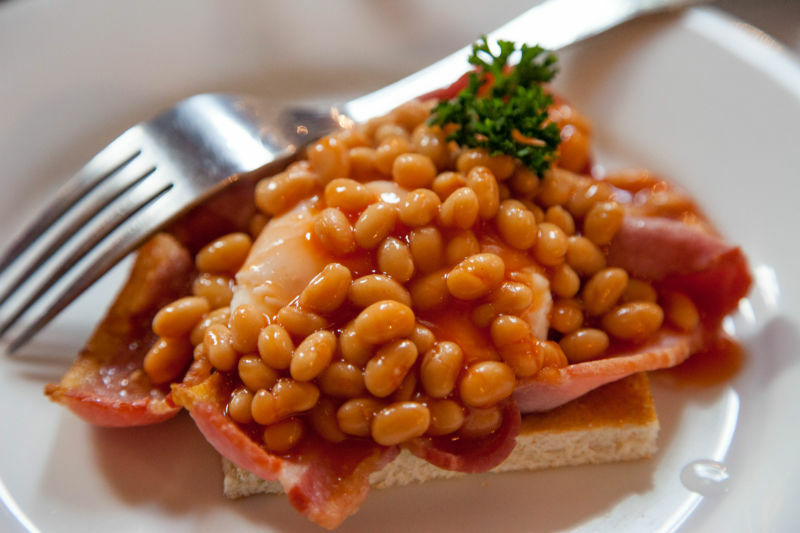 With the great exchange rates ($1 =£1.25), this is the time to travel and experience the UK.